My apologies to everyone for the late publishing of this blog article. It got stuck in draft mode until I just rescued it. 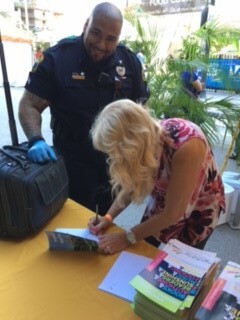 The 33rd Annual Miami Book Fair was so much fun! I was very honored to share a booth, and the day, in Writer’s Row with Barbara Biggart, Florida KidCare Outreach Specialist of the Parent Academy of Miami-Dade County Public Schools. They are such a great organization, who help families connect better. The Parent Academy is a free, year-round, parent engagement initiative of Miami-Dade County Public Schools that helps parents become full partners in their children’s education. And speaking of children, we greeted a torrid of school children. In particular, the students from Downtown Doral Charter Elementary School. We asked the kids one question: I f you wrote a book what would it be about? That got their creative juices flowing. They wrote their idea on a sticky note, and took it with them as an affirmation to stick on a mirror in their bedroom, or wherever they would see it the most. We hope that after seeing it every day, someday they will actually write the story. It was interesting to see what they came up with. For example, one girl wrote that she would name her story, “The Lady with the Horse’s Head”. She described a kid’s mystery to me about a woman who would lure unsuspecting people into an alley, turn into a monster with a horses’ head, and kill them. Allllllllrighty then…It gave me Goosebumps, and I write kids mystery books for a living. I met Emma Picard who was an International Traveler. 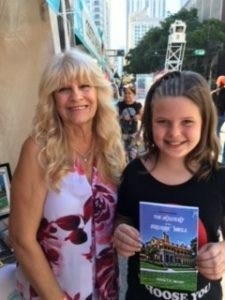 She and her family had journeyed all the way to Miami from Quebec, Canada! 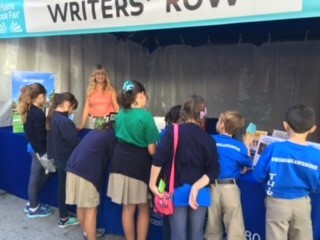 They were very excited to visit the Miami Book Fair. They said they didn’t look forward to going back to the ice and snow. Brrrr…Well, they sure made my day! And Emma was able to make the trip back to Canada with my book, The Mystery of the Square Well, tucked safely in her arms. 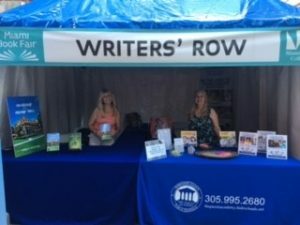 On Sunday, I worked in a booth with the South Florida Writer’s Association. What a great group! I encourage anyone interested in writing books, or just interested in thinking about writing one to look them up. You need not be a resident of Miami, or even live in Florida to join. Check out their website at: http://www.southfloridawritersassn.org/. 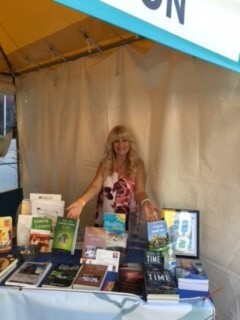 A special thanks to Don Daniels who helped display all of our books. was safe that he didn’t get a chance to check out the book sales for his daughter. —– Never fear, I signed a book for her. Thank you for keeping us safe so the rest of us could enjoy the book fair!